Sydney? Melbourne? What do you do when you can’t agree on the location of your capital city? Simple. You create a new one from scratch. The international competition to design Canberra was won by American architect Walter Burley Griffin in 1913. Much of what was eventually built, though, was either created by committee, or by people who don’t appear to have seen the original plans. As a result Canberra doesn’t quite feel ‘joined up’. 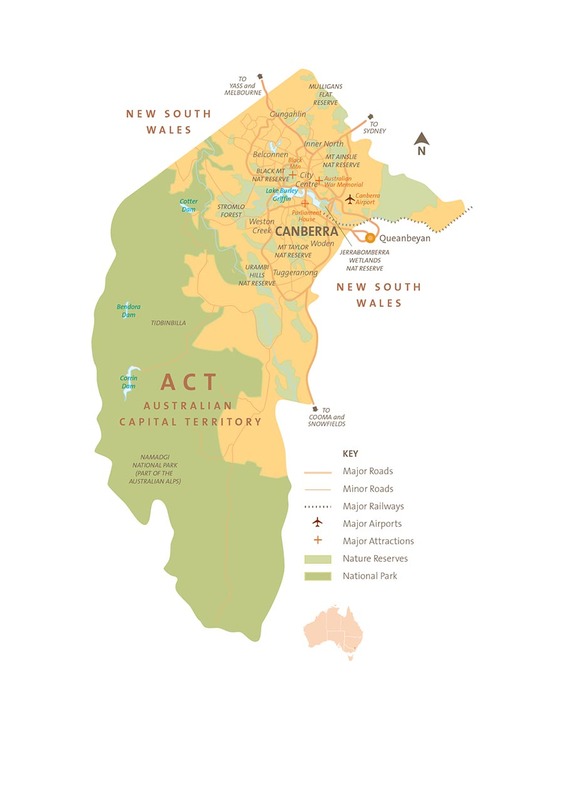 Should I see Australian Capital Territory? Canberra and its national park aside, ACT is really a collection of small towns and agricultural land. It’s not a tourist destination, as such. There are things to see and do in the nation’s capital – and it really is trying hard to shed its rather staid image – but if you’re on a tight deadline we’d suggest that you don’t make ACT a priority. Yes, its layout makes it officially (well, officially to us, at least) the most infuriating capital on earth – but bear with it. There’s still plenty to explore. That they finally settled on Canberra must be a relief to everyone living there. The name is said to mean ‘meeting place’ in a local Aboriginal language. There are various spellings of it: Kambera, Kamberra, Nganbra, and Nganbirra.